The Defending Stanley Cup Champions are at war to defend their crown. Last night, the Southern California Kings hosted the Northern California San Jose Sharks in the first game of the Western Conference Semifinals, and there wasn’t too much civil about it. 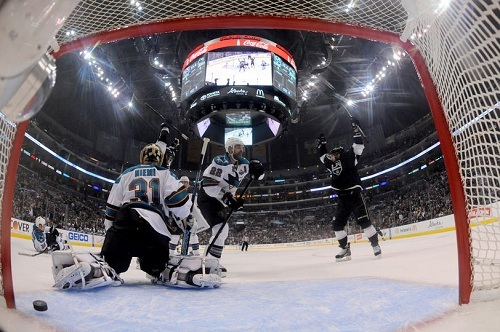 The Sharks had a full week to recuperate and regroup after winning their series against Vancouver with a sweep. Los Angeles was missing forward Kyle Clifford due to an undisclosed injury, and skating in his stead was hard-hitting Jordan Nolan. Details of Clifford’s injury have not been made public, as is the fashion of the playoffs. Jake Muzzin put the Kings at a disadvantage when he got an early first period interference penalty called against him, giving the Sharks three opportunities to score a goal. Jonathan Quick kept them out and brought the team through the first 20 minutes. It looked like it would be a scoreless period, but Kings’ Russian defenseman Slava Voynov shot a puck in with only 12.9 seconds remaining on the clock. The second period saw one goal originally credited to Voynov, but reassigned to Mike Richards after review. Torres nearly left the ice when he braced to hit Stoll. Stoll was unfortunately skating with his head down when he was charged. It will be up to the league to decide intent and determine if contact was made to Stoll’s head or just his shoulder. San Jose Sharks v Los Angeles Kings – Game One, LOS ANGELES, CA – MAY 14: The Los Angeles Kings celebrate after a goal against Antti Niemi #31 of the San Jose Sharks in Game One of the Western Conference Semifinals during the 2013 NHL Stanley Cup Playoffs at Staples Center on May 14, 2013 in Los Angeles, California. One thing is certain. The new and improved Torres who has purportedly cleaned up his act since being suspended for 25 games last postseason when he, as a Coyote, put Chicago Blackhawks Marian Hossa in the hospital, would be wise to avoid controversial hits like this one. Rather than showing anything more than feigned remorse, he toes the line to see how close he can get before league officials call him out. How bad will his next “clean” hit be, and who will he take out of a game, or worse? Injuries in hockey happen; they just seem to happen more often and are much worse when Torres is on the ice. But back to the game, superior play by Quick brought the team their second shutout of the postseason. The Kings were outshot 35 to 20, once again falling back on their goaltending, without which they would have never made it past the first round. They are missing a lot of key players and have plenty of young rookies on the ice. Still, they are a powerhouse whose strength has never been star players (other than ninja Jedi Quick), but who dominated last year because they gelled so well as a team. I’m not diminishing the star power of players like Jeff Carter; I’m merely stating that the Kings work best when the players work together. With players coming and going with injuries (mostly going), the lines and defensive pairs will be mixed up. It is proving to be a challenge that they will have to work through. They still have 11 more games to win. You can watch the Torres hit on Stoll below.